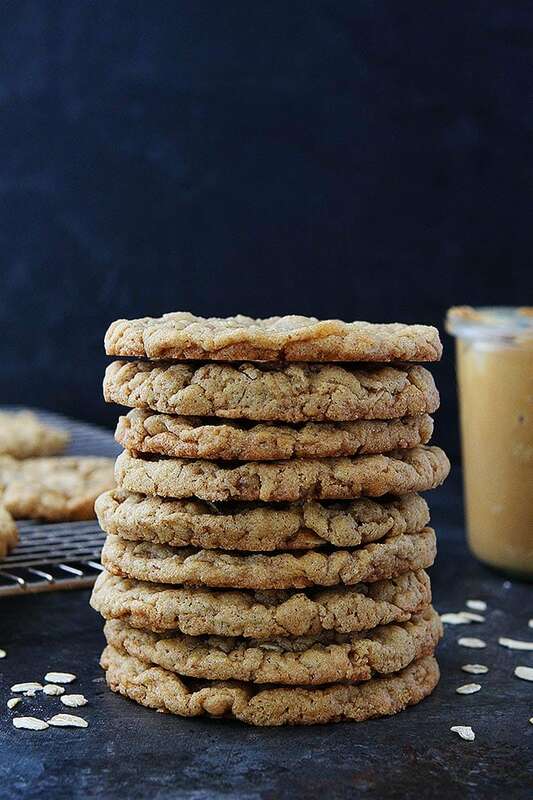 Peanut Butter Oatmeal Cookies are soft, chewy, and loaded with peanut butter flavor! Peanut butter lovers will go crazy for these cookies! I was in the mood to bake this week, big surprise, right? Well, I will be honest, I was really in the mood to eat cookies, sure the baking part is fun, but the eating part is the BEST part. You can’t beat a batch of freshly baked cookies. I was craving cookies like mad so I baked a batch of my favorite Peanut Butter Oatmeal Cookies. They are peanut butter cookie perfection! 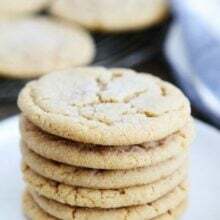 The cookies are soft, chewy, and LOADED with peanut butter flavor. Peanut butter fans, you are going to LOVE these cookies! They are peanut butter cookie perfection! I love these cookies because I always have the ingredients on hand. You don’t need any special ingredients, but that doesn’t mean the cookies aren’t special, they are VERY special. Every tine I make these cookies they get rave reviews by family and friends. They are just a REALLY good cookie, a classic! Use old fashioned oats, not quick oats for this recipe. Don’t skip the cinnamon, it gives the cookies an extra hint of deliciousness. For this recipe, I don’t use natural peanut butter. JIF or Skippy or a similar brand works best. I use creamy peanut butter, but chunky would be good too. I love the simplicity of these cookies but feel free to add in chocolate chips if you wish. Don’t over bake the cookies. Remove from the oven when the edges are set but the middles are still soft. They will finish baking on the baking sheet. You want them to be soft and chewy. These cookies will keep in an airtight container on the counter for up to 4 days. These cookies also freeze well. Place cooled cookies in a freezer bag or container and freezer for up to one month. They are good frozen or you can thaw them before eating. 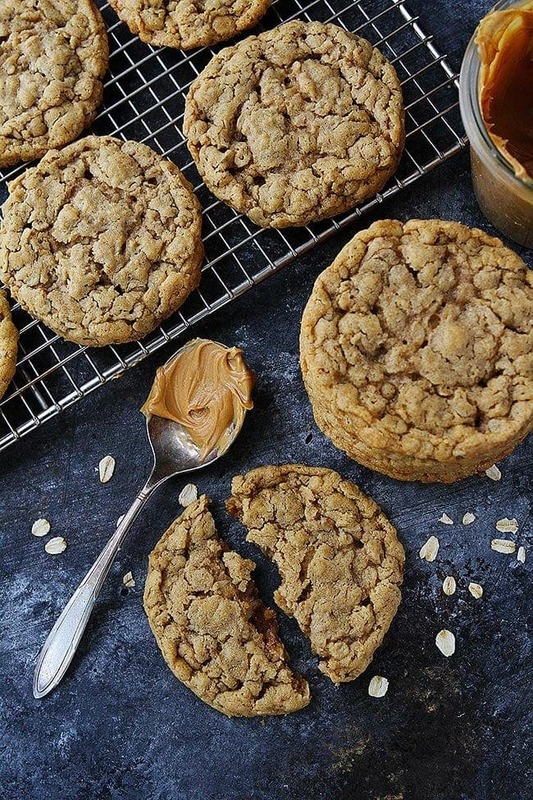 The next time you need a cookie fix, make a batch of Peanut Butter Oatmeal Cookies. These simple cookies are always a winner! These soft and chewy peanut butter oatmeal cookies will for sure become a family favorite cookie! Preheat the oven to 350 degrees F. Line two large baking sheet with Silpat baking mats or parchment paper. Set aside. In a medium bowl, whisk together the oats, flour, baking soda, salt, and cinnamon. Set aside. Using a mixer, beat the butter, peanut butter, and sugars together until creamy, this will take about 2 minutes, on medium speed. Beat in the egg and vanilla extract. Mix until well combined. On low, add in the dry ingredients and mix until just until the combined. Scoop the cookies into round balls and place on the prepared baking sheets, leaving 2 inches in between cookies. Bake for 10-12 minutes, or until the cookies are lightly browned around the edges, but still soft in the middle. Remove cookies from oven and let cool on the baking sheet for about 5 minutes. Transfer to a wire rack and cool completely. Oats and peanut butter, that is a combo I cannot resist! yummm mini PB cups! perfect touch! these look good! Yay for peanut butter haha. I’m glad you enjoyed those yummy-looking cookies. I wish your husband a safe trip back home. Totally up my alley! These look delicious! Oooooh yum! I’m definitely trying these! I’ve been wanting some yummy pb cookies lately, just haven’t found the right recipe to try! Thanks! Haha, I think I’d call this blog further evidence of your peanut-butter baking adventures — but if you need to get rid of some more evidence you can always mail those delicious morsels to me. I can personally attest to the fact that these cookies are absolutely delicious. They are perfectly chewy with a great hit of peanut butter flavor, which is not overwhelming in any way. These sound so yummy! I was going to attempt your New York Chocolate Chip Cookie recipe find.. but I usually only make cookies at the spur of the moment when we all need a quick fix.. the 24 hour refrigeration time caused me to say next time. But these would be perfect for a quick cookie fix! 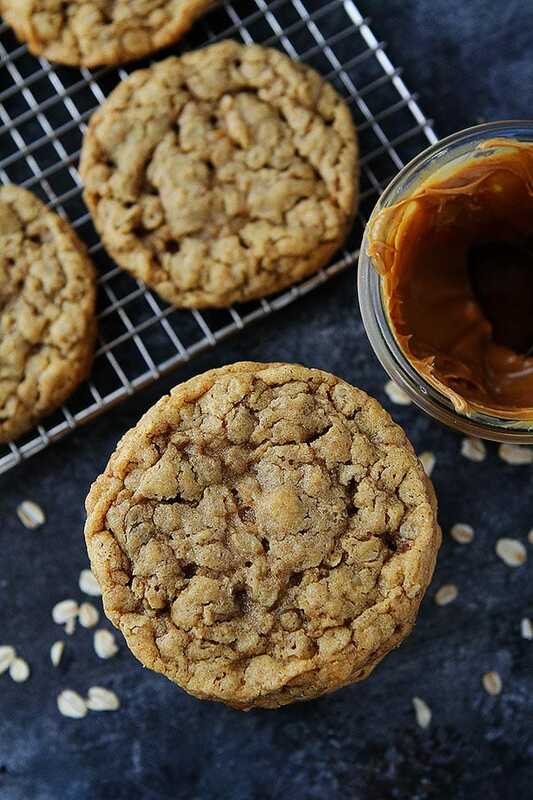 The only thing better than an oatmeal cookie is an oatmeal cookie with peanut butter. These look wonderful, Maria. the cookies look delicious! I love the idea of adding mini Reese’s! Just when I thought I have eaten every kind of cookie – you surprise me with these. How yummy are those?? They look so tasty! I love cinnamon and peanut butter, BTW. They are meant to be! Looks great! Your plate really adds a lot of pizazz! B/c I am a shameless PB addict, I would replace the Reeces chips with more PB chips and drool all over myself as I inhaled these…oh yum. those are some massive and amazing cookies, maria! i don’t think i’ve ever had peanut butter and oatmeal in the same batch of cookies, but there’s no doubt i’d love it! Mini peanut butter cups….how have I not found these?!? My boyfriend is going to love these. Thanks for sharing! Love the mini Reese’s peanut butter cups in these! My monster cookie has oatmeal and peanut butter… but I have never thought to do JUST an oatmeal peanut butter cookie! Brilliant! It sounds delish and looks even better… GREAT site and GREAT photography!! I made PB Oatmeal Cookies today! But they are nowhere near as scrumptious as yours with the PB cups! The cookies look great, love the crackly look. Wow. I need to find mini pb cups! This recipe is great!! I can’t wait to make these. I took one home with me, but my husband ate half of it, so I only got one half the next morning. It was fantastic! I love peanut butter cookies! Doesn’t it ever amaze you just how many varieties of cookies there are? I keep baking and baking, and there’s so many left to try. It’s really a wonderful thing 🙂 These look so good, and they’ve been added to my list! 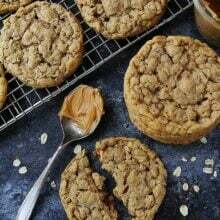 I love oatmeal cookies – great idea to make them peanut butter! These are my favorite cookies! And they photographed well after all! I could probably eat eat least ten of these in one sitting. I love their crackly tops. pretty. These cookies look irresistible! I have a box of oatmeal around waiting to be consumed, thanks for the idea! You can’t see me but I’m desperately trying to hide the computer screen from my Hubs or he’ll force me to make these cookies for him. HA HA! I love those little PB cups! Looks like a great cookie! These look delicious! Fortunately, we all like (and can eat) peanut butter here, so I’m putting these at the top of my cookie list! Do you use natural peanut butter or the more conventional Jiffy-type peanut butter? I only keep the natural stuff in my house, but I find that some recipes don’t work as well with it. Love the mini pb cups–I need to track some of those down. Two of my favorite cookies in one – yum!!! 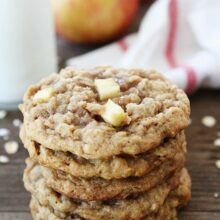 Yum… I was just thinking about baking some peanut butter oatmeal cookies! I think you read my mind… These look great. This looks Great! I can’t wait to try it on my new Silpat Baking Mat. I just purchased it at a fantastic price. No better time than the present to try out a new recipe. I made these cookies today. They turned out great, although I did use natural peanut butter. I also excluded the peanut butter cups, it still turned out really good. Thanks for sharing the recipe. Oooh, oatmeal and pb. I haven’t tried that combo in a cookie. Sounds great! I love using crunchy pb or chopped peanuts in cookies. I agree, it adds a nice texture. Anything with peanut butter and chocolate is a fav in my cook. I’ll have to try these , right now my go to is the NYtime choc chip cookie, but I’ll have to switch it up! That might just be the perfect little cookie! What gorgeous cookies…almost too perfect to eat! I like that plate too. Ahhh how lovely that you get the occasional chance to indulge in some peanut love! 😀 I suppose it would make it more exciting and something to look forward to! Yummy! Those look super on that pretty plate! I adore peanut butter cookies! Thanks for the recipe! Man, they look good. I like the cracked surface, it looked like dried earth in a desert but in a good way!! I love peanut butter cups but don’t know where to get them in the UK since Woolworths went under. Those look so good! I love that you added mini reeses pb cups how decadent of you =). I bet these cookies were filled with moist chewy awesome flavor! Right…got to make PB quick because this is something I’d love to make soon! Truly yum cookies Maria! Well, you know what they say, when the cat’s away, the mice…will bake with peanut butter. 🙂 Glad you had some good cookies to keep you company while the hubs was gone! Peanut butter and chocolate. My favourite combo at the moment! Yum!! I made a half batch of these yesterday (beating one egg, letting it sit for a second, then measuring out two tbsp to halve it) with chocolate chips and they were so yummy! My husband loved them too. Cate-I am glad you enjoyed the cookies! I was wondering could I chill this batter overnight before baking? Jackie-Yes, you can chill this dough and bake off later. Yum, chocolate, peanut butter and oatmeal all in one?? Can’t go wrong with that combination in cookie form! These are classic! Nothing better than peanut butter and chocolate! YUM!! 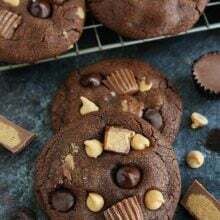 I made these cookies with Reese’s Pieces instead of peanut butter cups and they were AMAZING!!! This may be the best peanut butter cookie recipe I’ve ever baked. Thanks so much!!! Made these last week and they were huge hit. Did use PB chips instead of chocolate Hubs not big choco fan. He said they were the best we have made. Those beautiful crackled top cookies with the little peanut butter cups peaking out are a perfect way to indulge in some peanut butter love. These look and sound amazing! Yum! very good but mine stayed in little balls. i bake all of the time (love your recipes!! you are a fabulous baker!) and i’m not sure what i did wrong? Also, Caleb is adorable!! I have a 10 month old son so I always love hearing what Caleb’s up to! Mine stayed in balls too. What went wrong?? I also bake all the time! Not sure why! Maybe add a little less flour? I’ve never had a problem though. So I just stumbled across your wonderful site after looking for a unique cookie recipe. I never had these combonations and I was willing to try since I was in a baking mood. Let me tell you! These are excellent! My 2nd batch is in the oven as we speak. My fiance has eaten half of the first batch already. I will definetely spread the word about your blog and your recipes. Great cookies ! I just made the batter without adding the cups and they completely satisfied my peanut butter cookie craving nicely! Just made these and they are soooo yummy! I used my own home-milled whole wheat flour and –wow! Super soft yet chewy! I wonder if substituting honey for the white sugar would work? I love p.b., oatmeal and honey combos! These were exceptional cookies. My husband liked them better than just plain peanut butter cookies! I would very much like to try these, but I am a little confused. Some of the comments talk about adding peanut butter cups or peanut butter chips, but I don’t see a mention of these ingredient in the recipe. If I were to make the additions, how much do you recommend? If I am overlooking this information, I apologize. Thank you! These were absolutely delicious! I added a heaping 1/2 cup of peanut butter chips for extra yum. What wonderful cookie recipes you have! Thank you. Can you use quick oats instead of old fashion? I made these cookies today and my husband said they were the best he ever had! I just finished making these and they are very tasty. My only problem is they didn’t spread out very much and I don’t know why. I mixed some with white chocolate chips, some with chocolate chips, and some with honey roasted peanuts. All delicious! Hmmm, maybe because all of the extras??? Or too much flour??? Or your butter was too cold??? You can always slightly press down on the cookies with the palm of your hand before baking if you are worried they won’t spread. I have never had a problem with this recipe though. I just made these and they are delicious! Had to cook them a little longer (about 14 min per batch) but that’s probably our wonky oven. Fantastic! These cookies were PERFECT. I was looking for something I could make using ingredients I had on hand. Mine were not as flat as the picture, they were fluffier but still baked nicely in the center. I added double the cinnamon. Will definitely make this again and maybe add in chocolate chips next time. Absolutely Delicious! My family gobbled them up. I added choc chips to half of them and they were perfect. Wow these cookies are so delicious!! I haven’t made cookies in forever and found these through a search for peanut butter oatmeal. Really amazing! I also put some chocolate toffee pieces in them and made for some nice texture. Thank you so much! Love the chocolate toffee addition! Yum! Excellent recipe. The cookies come out light and airy with a perfect amount of crunch. Will DEFINITELY make again!! Great basic recipe. Due to food allergies I used sunflower butter and gluten free oats and flour. Needed to freeze cookie balls for 10 minutes. The second batch I added white chips and made half with chopped peanuts. Next batch is macadamia nuts and white chocolate. Thank you for a fabulous cookie base. These cookies and your peanut butter ones (rolled in sugar) are the best. Everyone loves them! So happy you love both recipes! This is an excellent recipe! Makes Awesome Cookies! I add 6 oz. of chocolate chips per batch which satisfies both the peanut butter and chocolate lover in me. Such a great recipe. Thank you! Just made these and added chocolate chips and used crunchy peanut butter. These are the best peanut butter oatmeal chocolate chip cookie of all time. Wonderful chewy texture, not too sweet, look exactly like the cookies in the picture and absolutely delicious. Thanks so much for this fabulous recipe. It’s a keeper and I’ll be making these over and over! Glad you loved the cookies! I need to make another batch! Do you have the nutritional values for these cookies including grams of sugar and protein? Could I replace the all purpose flour for the almond flour? Came out perfect. I got out my stand mixer and made a double batch. I used partly whole wheat flour, sub half the butter for shortening and added some chocolate chips. I will make this again for an everyday or traveling cookie. Glad you loved the cookies! I made this recipe but I added chocolate chips. Was a hit with everyone. I wanted to bake something quick and easy last night and this recipe was perfect for that! I used 1/2 cup of nut flour ( almonds, coconuts, pecans and walnuts) instead of all purpose flour. I also added chocolate chips to 1/2 the batch. It all came out amazing! Omg…….I can’t stop…..These are sooooo delicious…….thank you for ANOTHER great recipe! Been following you for years! I’ve been using this for lactation and I make them at least twice a week. My husband tried one out of curiosity and requests them! Soooo good! Mine are baking now….in the meantime I’m licking the bowl! I just made these cookies and they are excellent! They come out crispy on the outside and chewy on the inside. I baked a half batch 5 minutes longer and they are super crispy all over just like I like them. Definitely making these again! These cookies were EXCELLENT!!! I must have made them very small because my batch yielded 45! Since it’s Christmas, I decorated them with green and red jimmies. This will become a new tradition! Did you forget to include the butter? I don’t see any butter mentioned in this recipe… you mention it in the directions.?? This is amazing, quick and easy recipe I have no peanut butter available, so I made a twist on the recipes, I put apples instead. Perfect! Made these today & quite pleased My grandsons are tiring of their usual breakfast so though I’d tries come healthier cookies. I added cooked, crumbled bacon & diced cranberries. I also cut the sugars in half & still very sweet. Only thing i notices is mine did not spread like the picture – but they are a hit! any other ideas to turn these into a breakfat cookie? I used the quick cook oats because that is all I had. I also chilled the dough before making balls and putting on the trays. I always chill to re constitute the butter. Baking took 13 minutes, because of the chilling I expect. Cookies came out nice. Deb gives it a 4/5. Those look absolutely delicious. I’m not a chocolate (in cooking) fan, but I’m a peanut butter addict, always have been. So can you tell me what you mean by ‘natural peanut butter’ that you don’t use? I don’t know what that is and I don’t know if the stuff I’d be using would work. Really tasty and simple to make. I made a half recipe and added a handful of golden raisins. Can’t afford to make the full amount because then I’ll eat them all. You know, too much of a GOOD thing. I made them dairy & egg free by using Nuttelex instead of butter and “no-egg replacer” instead of the egg. SO GOOOOOODDD. Can’t stop won’t stop eating them. Glad you love the cookies! We just made these again yesterday and they are indeed the best cookie ever. We have made these several times since you originally posted the recipe and they have been declared ‘the perfect cookie’. We have added ginger and cut back on the cinnamon. It can be fun to play around with a recipe after it has been mastered – of course, you know that! In any case, many thanks for an absolutely splendid recipe. Love the ginger addition! So glad you like the cookies! I just made these oatmeal peanutbutter cookies and their to DIE FOR YUUUMMMYYYY!!!! I used natural peanut butter with great results! The cookies are chewy and soft, although they did not spread as much as the pictures. I prepped the dough the night before, scooped it into balls and then refrigerated it overnight. The next day I used a glass to flatten the cookies slightly right before baking. I liked the addition of cinnamon, although I will try 1/4 tsp next time! Thanks for another great cookie recipe! I’ve tried baking quite a few different recipes to test which one my husband and i both agreed to be the best and this recipe by far hands down our favorite of all! Thank you! I substituted ground oats for the flour due to a wheat allergy and these are great cookies. Wonderful flavor with the cinnamon.